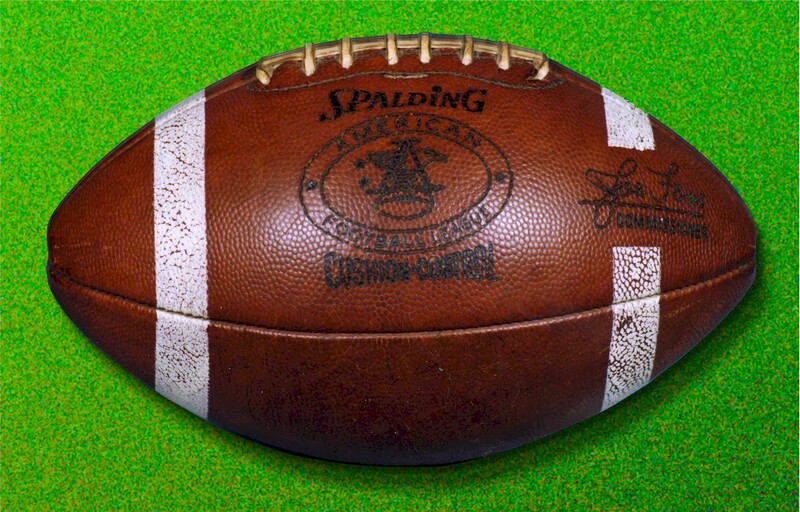 When the American Football League teams first took the field in 1960, the ball they played with was produced by the Spalding company, a sportsgear manufacturer who for years made the ball used by most major college conferences, the J5-V football. Spalding got the AFL contract and made a version of that ball, bearing the American Football League logo, for the new league. My faulty memory told me that the AFL ball was the same as the collegiate, the J5-V. But AFL fan Rich Snyder recently revealed information that the initial ball used by.the AFL was the Spalding J6-V Cushion-Control ball. Evidently the '6' was used to distinguish it from the standard collegiate J5-V, because the AFL ball had an added layer of foam under the outer leather. To my knowledge, these balls were marked 'Cushion Control', but did not actually say 'J6-V'. From 1960 through 1965, AFL footballs bore the signature of the AFL's first Commissioner: flying ace, sportsman and former South Dakota Governor Joe Foss. The 'Foss' ball changed slightly over the years, in its texture, striping, and logo design. Early in 1966, the AFL owners named Al Davis of the Raiders as AFL Commissioner, to wage the 'signing war' with the other league. For the 1966 AFL season, footballs were prepared with Davis's signature. Davis's efforts in signing (or threatening to sign) major stars from the other league were so successful that behind Davis' back, several nfl owners approached Lamar Hunt, asking to merge with the AFL. The merger was agreed to without Al Davis's or nfl honcho alvin rozelle's knowledge. Then the American Football League owners unfortunately agreed to call the combined leagues the nfl and to leave rozelle as the commissioner of the two leagues, with Milt Woodard as the President of the AFL. One of rozelle's first acts was to order all the "Davis J5-V's" destroyed. Evidently, a few survived, and one is shown below. There was also an AFL J5-V ball with rozelle's signature, but I refuse to defile this site with that image. 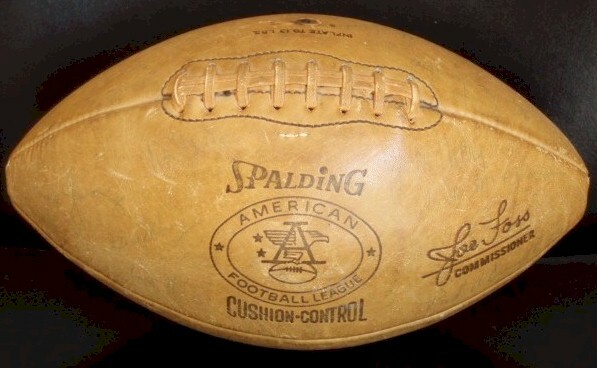 The original American Football League Game Ball was the Spalding J6-V model, also called the Spalding "Cushion Control" Football. The ball was 1/4" thinner and longer than the Wilson "Duke" used by the nfl, and it featured a thin cushioned foam liner under the leather and was billed as a near "fumble-less football". It's been noted that Spalding discontinued the manufacturing of the J6-V model circa 1965, however Spalding has not confirmed that date. Photos show the J6-V ball was used in US colleges into the later 1960's. In 1965, the AFL changed to the Spalding J5-V model. The J5-V was the same size as the J6-V but without the foam cushion liner. Both the J6-V and J5-V models were originally targeted to the college football market. The J5-V model is still in production today, however its technical makeup is no longer the same as the 1960's AFL Game Ball. 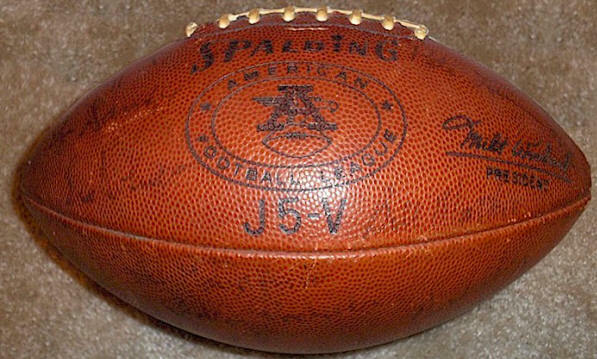 The CFL used a Spalding Canada J5-V from 1958 to 1995, but also with different specs than the US Spalding AFL J6-V or J5-V.
Joe Foss's (Commissioner) signature was on all the AFL J6-V models (1960 to 1965). Foss was on the first of the J5-V balls produced as well (1965). 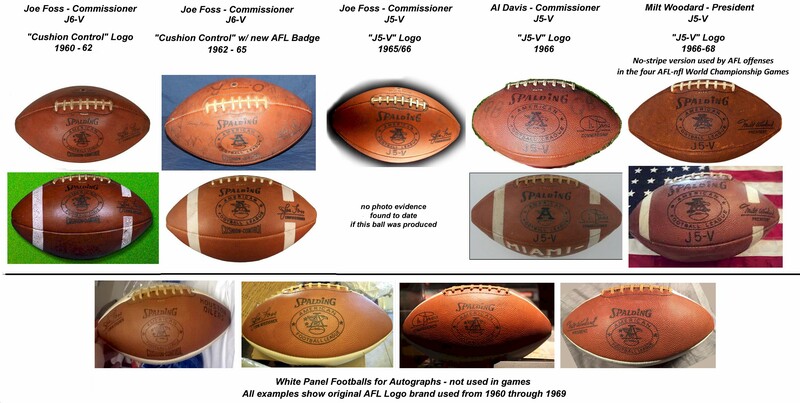 Al Davis (Commissioner)(1966), Milt Woodard (President)(1966-1969), and pete rozelle (commissioner of the AFL and the nfl)(1966-1969) signature J5-V balls were produced in the years noted and used over the 1966 to 1969 period of the AFL. Two slightly different versions of the AFL logo were branded on the J6-V ball. The change to the second version of the logo was in 1962. 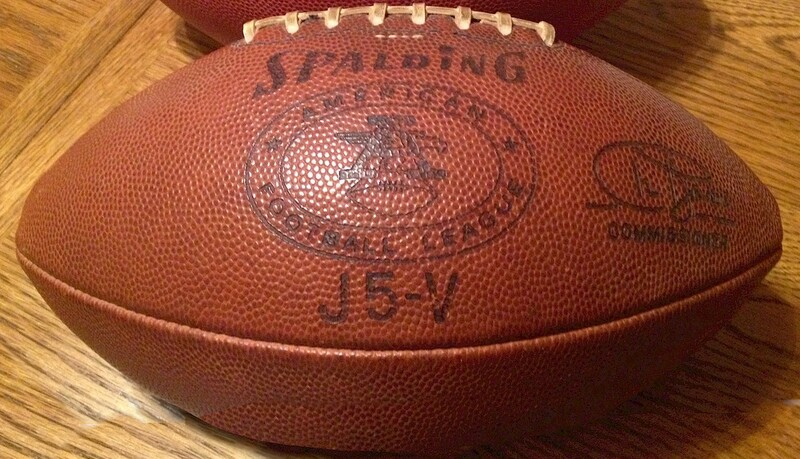 That second logo brand was used on all J5-V game balls. The first version of the logo was branded into all white panel autograph balls produced from 1960 to 1969. Both J6-V and J5-V white panel balls were produced, and each of the 4 signatures were used on white panel autograph balls as well. White striped and un-striped versions of both the J6-V and the J5-V were produced. The striped version was used during AFL night games. 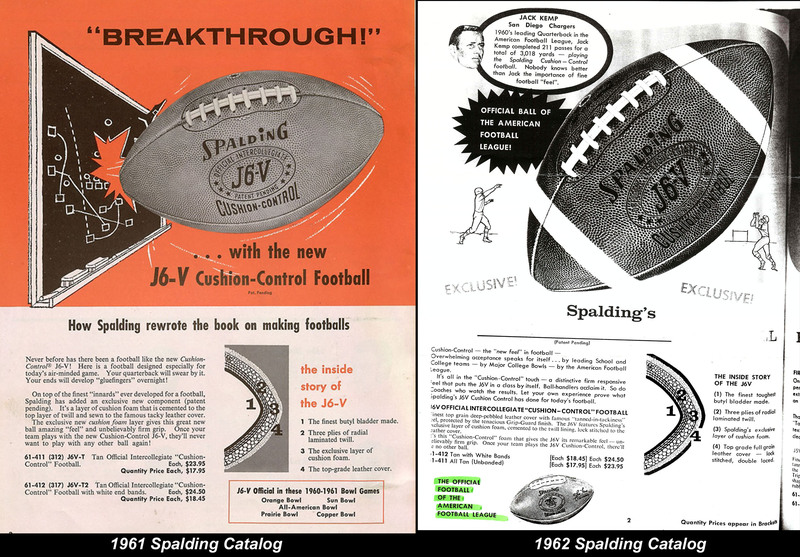 While an apparent code was branded on some of the J6-V and J5-V balls, Spalding does not confirm these markings were date codes and no production date code information seems to have been published from Spalding for the AFL game balls. In all, there were at least 11 and maybe 12 different versions of the AFL Game Ball produced over the 10 years of the AFL. The rarest of the AFL Game Balls are the Al Davis signature balls. Although 3 versions of the Davis ball were produced by Spalding (striped and plain game balls and white panel autograph balls), only a small total number were made as Al's status as the Commissioner lasted only 4 months (April to July of 1966). AFL supporter and historian Ange Coniglio reports that when Milt Woodard became the AFL President in July of 1966, rozelle tried to have all the Davis signature balls destroyed, but that it never happened. Davis signature game balls were used during AFL games - notably in the first game ever won by the Miami Dolphins (Dolphins v Broncos - 10/16/1966).